Famous for its beaches and the great waves, hiking in Lanzarote is so good that it actually is a fantastic destination even for nature lovers. This is the easternmost of the main Canary Islands, and the third most populated in the archipelago. Arrecife is the capital and the main city. Lanzarote is known as “the island of eternal spring.” The weather is very mild on the island, as it only gets 16 days of rain in a year (this means that it’s virtually always a good time to go hiking in Lanzarote!). What it does get, however, is wind: this blows regularly in Lanzarote. Lanzarote is of volcanic origins (like the rest of the Canary Islands), which means the landscape is quite barren. Famara and Montañas del Fuego, two of the highest “mountains” on the island, are separated by El Jable desert separate. The highest peak is Peñas del Chache, which reaches 670 meters. Most tourists who visit Lanzarote each year go there to enjoy its beautiful beaches. Papagayo, a series of small coves nestled between lava formations, is the most famous one. Diving is another popular activity on the island, as well as surfing, thanks to the excellent waves. Adding to these, there are some beautiful small cities and villages; fantastic locally produced wine; and the fabulous nature. Lanzarote is home to the Timanfaya Natural Park, and there are several volcanoes that call to be hiked. Between the beaches, the diving and surfing, the villages and the volcanoes, there are many great excursions in Lanzarote. Some hiking trails link the gorgeous beaches to the nice villages (such as the hike from Femés to Papagayo); others like the one of Caldera Blanca go to the craters of volcanoes. 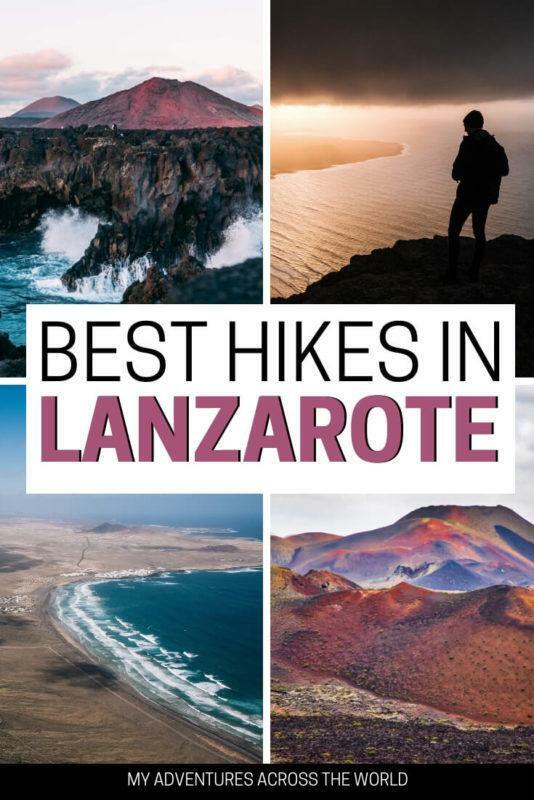 This post strictly focuses on hiking in Lanzarote, mentioning the best trails to enjoy nature and views, and providing a few tips on how to make the most of the island. Interested in reading about hikes in mainland Spain? Check this post! For hikes in other Canary Islands, read my posts about Gran Canaria and Tenerife. One of the nicest places to go hiking in Lanzarote is in the area of La Graciosa, on a trail that its inhabitants used to take to walk to Lanzarote and back. It is a 4 km trail one way, and the difficulty depends on whether you walk it downhill or uphill. The first part of the trail, around Yé towards Guinate is along cobbled path, and it zig zags down. The trail then goes along the cliffs of Famara, and the volcanic rocks make it a bit slippery. The views of the coast during the hike are fantastic, and on the trail it is possible to admire several native species of fauna and flora. In the south west of Lanzarote there is Los Ajaches. This is a large volcanic formation in what is thought to be the oldest part of the island. The trail isn’t long (around 6 km) but it is very steep, making it one of the most challenging places to go hiking in Lanzarote. The starting point is in Femés. From there, the trail goes along a pathway, a track, pedestrian ways as well as roads. The vegetation along the hike is beautiful. Wildlife in this part of the island abounds, with species such as the steppe birds, birds of prey and sea birds that live on the coastal cliffs. Make sure to take water (and food) with you as there’s none along the way. One of the nicest excursions in Lanzarote is that of Guatiza. It’s not a hard hike, but the trail is rather long. It is a 27.5 km oval trail that goes through Tinguanton and Loz Valles. Going towards Haria, the views from the Mirador are breathtaking. Another places that can be visited along the way is the hermitage of Ermita de las Nieves. One of the nicest hikes in Lanzarote is the one that goes from Fémes to Papagayo. It offers the very best of the island: mountain views; coast views that span to the Altantic and Fuerteventura; and gorgeous beaches at the end. The starting point is in Fémes, a village where only 200 people live and which is a favorite for people who plan to go hiking in Lanzarote. There is also longer trail that goes through Los Ajaches and that can be walked in around 4 hours. This 10.6 km hike that starts in El Golfo, a small fishing village on the west coast of Lanzarote, makes up for one of the top excursions in Lanzarote as it affords incredible views of the volcanic landscape. The trail actually is on the lava flows and it is quite easy to follow – however, it’s to always stay on the track because there are bubbles in the lava. The trail reaches Charco de los Clicos, a funky looking lagoon where the Rupia-Maritima algae turned the water bright green. It’s an incredible place, as the background is very dark because of the black volcanic sand. The area of Haria and El Bosquecillo is one of the nicest to go hiking in Lanzarote. The trail that links the two starts in Haria and is 8 km long. It goes to two beautiful viewpoints –the Mirador Montaña Ganda and El Bosquecillo (which is Lanzarote’s only forest). The view of Famara from the Mirador El Bosquecillo is fantastic. Playa Quemada is the starting point of yet another beautiful hike in Lanzarote. The walk is fairly easy (though it is a 12 km walk there and back), on a trail that follows the cliffs. The trail goes through Puerto Calero, a lovely marina from where there are water taxis to Puerto del Carmen – especially great if you need a break from walking! Caldera Blanca is one of the highest peaks on the island and it is one of the nicest places to go hiking in Lanzarote. The hike goes through a large volcanic area. The walk is on a lava surface which was formed through the 1730 and 1736 eruptions. The overall hike takes 4 hours. The starting point is the church of Our Lady of Sorrows, the saint patron of Lanzarote. The trail follows a marked pathways, a track and even a tarred road in points. It is an easy walk, suitable for families with children. However, it’s not a very popular trail. There are incredible views of the Montañas del Fuego. There is no shade or water throughout the hike, so make sure to carry enough water and to wear sunblock! Another lovely area to go hiking in Lanzarote is that of Cueva de los Verdes, near Haria. The trail is really easy, perfect for families with children. It’s a 2 km trail part of of a 6 km volcanic gallery. The name of the cave takes from its former owners, the Verdes. The cave was formed by an eruption from the nearby Monte Corona, which took place between 3000 and 5000 years ago. There are guided tours of the cave every day between 10:00 am and 6:00 pm. Caleta de Sebo, capital of La Graciosa, can be reached by ferry from Orzola, located in the north of Lanzarote. Once there, there are several gorgeous tropical beaches and walks (as well as people who offer 4X4 rides). It’s one of the nicest excursions in Lanzarote. Mske sure not to miss Playa de las Conchas, the most beautiful beach. Thanks to the spring-like weather and the lack of rain any time of the year is good to go hiking in Lanzarote. One thing to keep in mind, however, is the lack of shade on most of the trails: make sure to wear a hat, apply sunblock and carry and drink plenty of water. Among the nicest places to visit in Lanzarote there is Arrecife, the capital of the island since 1852. It’s name is due to the reef (arrecife, in Spanish) that surrounds its most famous urban beach. It’s a small city, with a nice promenade and a beautiful beach (even though the buildings behind it are not nearly as beautiful); some nice shops; several unpretentious bars and restaurants. In Arrecife, the Castillo de San José, is a must see. This is a fortress built in the 1770s under orders of Carlos III to protect Arrecife from pirates. The construction of the castle was also meant to create more work opportunities. The views from the Castle are beautiful. The castle was completely restored in the 1970s and currently hosts a great exhibitions of pieces of Antoni Tàpies and Joan Miró. Another interesting place to visit is the César Manrique Foundation, which opened to visitors after Manrique’s death in 1992. What makes the place worth visiting is the fact that it’s been built on a lava flow and it follows the shape of the volcanic rock. Inside, there is an art gallery with works by Pablo Picasso and Joan Miró. One of the prettiest places to visit in Lanzarote is Teguise, which used to be the capital of the island until 1852. At the moment, it is one of the main tourist and cultural centers of Lanzarote. The city is located right in the center of the island, 10 km from the coast and at 200 meters above sea level. It has a number of good museums, a nice flea market every Sunday morning, and the historic center has a fantastic medieval look – it’s been declared an Architectural Historic Site. Lanzarote is one of the most famous tourist destination in Spain, though not nearly as developed as the rest of the big Canary Islands. However, it’s been recently upgrading its appeal so there are more accommodation options. Vanesa Center is a stylish apartment in the center of Arrecife. Click here for the latest rates and here for reviews. Hotel Lancelot, in Arrecife, has breathtaking sea views. Click here for the latest rates and here for reviews. Arrecife Gran Hotel also has a spa. Click here for the latest rates and here for reviews. Hotel Las Costas, in Puerto del Carmen, has a great pool. Click here for the latest rates and here for reviews. Casa Yuca is a nice holiday home in Teguise. Click here for the latest rates and here for reviews. Neptuno Suites is a fantastic resort in Costa Teguise. Click here for the latest rates and here for reviews. Cabañas Volcan Capellania is an excellent budget option in Tinguaton. Click here for the latest rates and here for reviews. Alma Libre is a lovely bed and breakfast in Guatize. Click here for the latest rates and here for reviews. There’s only one official camping sites in Lanzarote, in Papagayo Beach, which is fairly well equipped. It’s open from June to September. The only airport in Lanzarote is in Arrecife, at about 5 km southwest of the city. There are regular and budget flights to several destinations in Spain and Europe. More information about hiking in Lanzarote can be found on Happy Hiker, who also has his own book that can be found on Amazon and where he offers more detailed description of the trails. And this is a map of the trails in Lanzarote. Guided hikes are offered by Adrenaline Hunter and H.F. Holidays. For more hikes in the Canary Islands, read my posts on the best hikes in Tenerife and the best hikes in Gran Canaria. Also check my post on why I do not recommend hiking alone. Have you ever gone hiking in Lanzarote? What did you like the most about it?